You know that fine lines, wrinkles, and age spots can make you look older, but did you know that your hair can also age you? I'm not talking about having gray hair either. Your hair can betray you in other ways. I'm not scared of aging—I've earned every fine line and gray hair—but I am a firm believer in taking care of my skin and hair to help them look their best. Although my hair is very thick, my mom has been suffering from hair loss since she was younger. It's definitely a concern for me. Keep reading for my top tips to keep your hair looking great as you age. Just like some men get thinning hair, so do some women. In fact, 1 in 3 women will experience hereditary hair loss. It can start as early as your 20s, so it's definitely something to start thinking about when you're young, especially if your mom, grandma, or aunts have experienced hair loss. 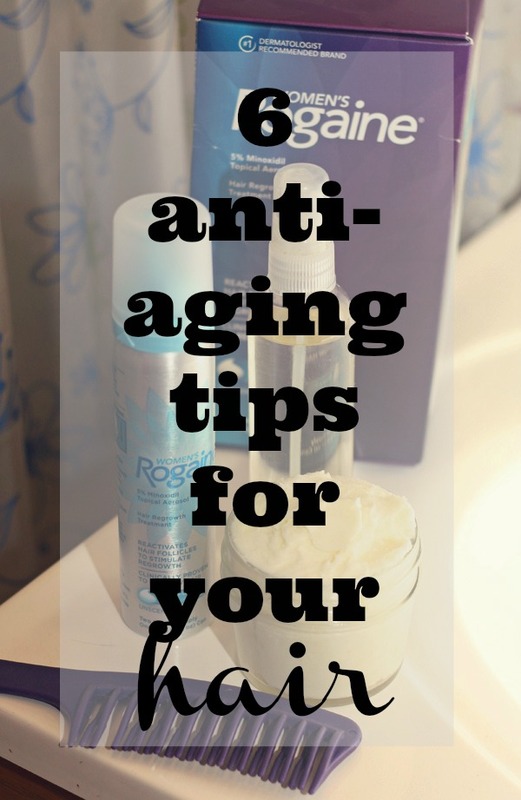 Just like you'd use anti-aging skin care products to prevent signs of aging, you can use anti-aging products for your hair. If you're starting to experience hereditary hair loss or think that you might be likely to get it, start using Women’s ROGAINE® Foam, which is clinically proven to regrow hair in 81 percent of women*, and new hairs are up to 48 percent thicker**. *Results based on a 6 month clinical study of once daily use of Women’s ROGAINE® 5% Minoxidil Topical Aerosol vs. Placebo. Use as directed. **Based on mean hair strand diameter. Using Women’s ROGAINE® Foam is easy. Start with dry or towel-dry hair. Dispense half of a capful into a bowl. Part your hair to reach your scalp and massage the product into your scalp. Let dry completely. Style as usual with your usual hair products. Use every day in the morning or in the evening. There's no buildup from the foam, so it won't weigh down your hair. You can even use it with chemically processed hair, but don't use it on the day that you use chemical treatments. Want to try Women’s ROGAINE® Foam for yourself? Click here for a money saving coupon off of your next purchase. Wet hair is more fragile than dry hair, but as you age, your hair gets even more fragile. Fragile hair is more prone to breakage, so be careful. Do not comb your hair when it's wet. If your hair really gets in knots when you wash it, try using a wide tooth comb in the shower while the conditioner is on your hair. After you wash and condition your hair, don't rub your hair with a towel because it can break your delicate strands. As you age, heat styling can cause more damage to your hair than it used to. Sometimes you can avoid using heat but not always. I wash my hair in the early evening to avoid using a hair dryer, but I know that this isn't practical for everyone. I also use a dry shampoo to get another day out of my straight hair when I use a flat iron. If you do need to use a heat appliance, use the lowest heat setting that works on your hair. You can also use a heat protection spray on your hair before using a blow dryer or flat iron. Pulling your hair back tightly in a ponytail, braid, or even wrapped in a towel can put too much stress on your hair and cause breakage. Wear your hair in a looser ponytail or skip the pony altogether. Even if you don't color your hair, the sun and some products can cause your hair color to fade. Chlorine from a pool or from your own water source can fade your color. When you're swimming, wear a cap to protect your hair. At home, consider a filter on your showerhead to filter out chlorine. Alcohol in products can also dry out your hair, so look for products without alcohol. As you age, your body naturally slows it's oil production on the scalp. This oil protects your hair, so it can really help to add back oils. I use a shine spray to keep my hair nourished. It also helps tame frizzy hair and help damaged hair look better. One of my lucky readers will win a year's supply of Women’s ROGAINE® Foam, which is a $150 value! This giveaway has a tight turn around, and I will need the winner's information within 48 hours of close to give to the brand. Winner must be in the United States and 18 years or older. One winner per household. Good luck!